The TI-99/4A is normally clocked at 3.0 megahertz, i.e. 3 millions oscillations per second. However, the TMS9900 microprocessor should be able to tolerate upto 4.0 MHz. It is therefore tempting to crank up the clock speed and gain 33% in execution speed. In fact, a later model of the TMS9900 was released, the TMS9900-40, that was meant to be clocked at 4 MHz. This one could be overclocked at 5 MHz or even 6 MHz with proper cooling. (Because CMOS gates only use current when then switch states, the faster you run a microprocessor, the more current it uses and the more it heats up. Not cooling it may end up destroying the chip). The clock signal inside the console is generated by the TIM9904 driver. This chip needs a signal 4 times as fast, so as to generate four different clock phases for the TMS9900 to use. It actually comes in two versions: the TIM9904 requires a 48 MHz crystal, and a tuning circuit to pick up the 12 MHz harmonic. The TIM9904A can use a 12 MHz crystal directly, with an optional tuning circuit for better stability. This page describes several possible modifications. If your console has a TIM9904A, an obvious solution to overclock it is to replace the 12 MHz crystal with a 16 MHz one. The only difficulty is to find an appropriate crystal. It should be a serial-type crystal, with a 20-75 Ohm resistance and a minimum of 6 mW power dissipation (which is a LOT). The suggested stability is 0.005% from 0 to 70 `C.
Open the console and locate the TIM9904 and its crystal. 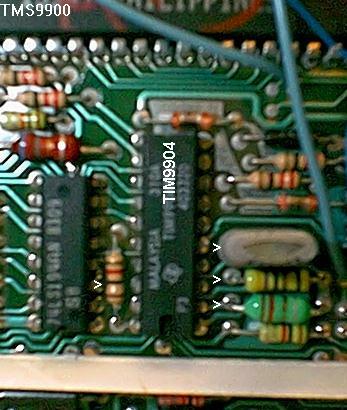 Here is a picture of the motherboard, and here is a blowup of the region when the TIM9904 is located. The crystal is easy to recognize: it's the tall metal container installed vertically near the TIM9904. In the holes where the crystal was, install two wires that go to the middle poles of a DPDT switch (dual poles dual terminals). Keep the wires as short as possible, while still long enough so you can install the switch in the console casing. Solder the 12 MHz crystal accross the two terminal on one side. Solder a 12 MHz crystal accross the two terminals on the other side. Note that I'm not 100% sure that both connections to the crystals need to be switched. It's quite possible that you could keep one common connection (say to XTAL1) and switch the other with a SPDT switch (single pole, dual terminal). I didn't either solutions. In either case, it's very likely that flipping the switch will crash the computer, if only because there may be a moment when the poles are not connected to either terminals. So you must first decide whether you want 3 or 4 MHz, set the switch to the proper position, then power-up the console. If your console has a TIM9904 (not A), it should have a 48 MHz crystal, with a resonnance circuitery tuned to pick up the 12 MHz harmonic. This raises the interesting possibility to change this tank circuit so as to pick the 16 MHz instead. L is the inductance of the coil. Ct is the sum of the external capacitor C and the capacitance of the printed circuit board Cb. To increase Fosc to 4 MHz, we need to decrease Ct by 0.75**2 = 0.56. This could be done by adding a second capacitor in series with the first one (as opposed to resistors, capacitors add up in parallel and decrease in series). A switch would let us bypass this second cap to obtain the original 3 MHz frequency. In my schematics book, L is indicated as .33 microHenry and C as 22 pF. If my calculations are correct, this means that, to pick 12 MHz, Ct should be 533 pF. Since the cap mounted on the motherboard is 22 pF, we can calculate that Cb is about 511 pF. This seems an awfull lot! Did I do a calculation mistake somewhere??? For Fosc = 16 MHz, we would need Ct to be 300 pF, which is impossible to achieve if the capacitance of the board is really that high. Too bad: if it worked, it is quite possible that we could change speed "on the fly" without crashing the console. Maybe I did do a calculation mistake: could someone check my math, please? Both the TIM9904 and the TIM9904A have the option of being driven by an external oscillator via the OSCIN pin, rather than with a crystal. In this case, the XTAL terminals should be connected to +5V and the tuning circuit should be replaced with a 130 Ohms resistor. Since there are cheap 3-states oscillator with an output enable pin, I figured it should be possible to connect two of these to the OSCIN pin and to enable either one or the other with a CRU bit. I tested this solution and it does work! It has the advantage that the speed can be toggled by software, at any time during a program execution. For instance, before calling the floppy disk controller, or the RS232 card, which both are time-sensitive. The TMS9901 interface controller is part of the console. Two of its pins are free for use: P0 (pin #38 ) and P1 (pin # 37). P0 is controlled by CRU bit 16 (address >0020), whereas P1 is controlled by CRU bit 17 (address >0022). Both pins are low upon reset, but the GROM routines switche P1 high during power-up. For this reason, I suggest you use P0. The 74LS04 hex inverter is also part of the console: there are a few unused gates on this chip (U604). One 12 MHz oscillator, 25 to 50% duty cycle. E.g. CTS Reeves MXO45HST-12.00 ($2.78 at Digikey). One 16 MHz oscillator, 25 to 50% duty cycle. E.g. CTS Reeves MXO45HST-16.00 ($2.78 also). One 130 Ohms resistor (+/- 10%). Gauge 26 and gauge 30 insulated wire. The suggested oscillators are half-size, which makes easier to fit them under the motherboard metal case. Here is their pinouts, viewed from under. The OE pin is near the only corner the is not rounded. It should also be marked with a dot on top of the chip. To do this modification, first open your console. Refer to my console surgery page if necessary. Then locate the TIM9904. Here is a picture of the motherboard to help you. Desolder and remove the crystal, and the two components installed just in front of it, towards the edge of the board (a cap and a coil). Also remove the resistor installed leghtwise on the other side of the TIM9904, connected to its upper-right pin. Here is a picture, in which the components to remove have been marked with arrowheads. Connect the crystal holes together, then to the TIM9904 Vcc pin (topmost right pin, the one the resistor was connected to). Isntall a 130 Ohms resistor in place of one of the other components that you removed (the cap and the coil). Here is a picture of the result. The newly installed resistor is marked with an arrowhead. Connect their Vcc pins together, and to a small length of gauge 26 wire. Connect their Gnd pins together, and to a small length of gauge 26 wire. Connect their Output pins together, and to a small length of gauge 30wire. Connect a longer piece of gauge 30 wire to the OE pin of each chip. Be carefull that no connection makes contact with the chip casing! Trim the pins as short as you can. First cover the place where the crystal, cap and coil were, with a piece of insulating tape. Place the two oscillators upside down on the tape. Solder the Gnd wire to the Gnd pin of the TIM9904 (the bottom left pin). Solder the Vcc wire to the Vcc pin of the TIM9904 (topmost right pin, the one the resistor was connected to). 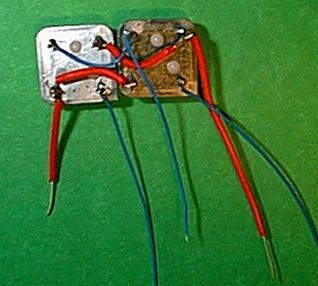 Attach the Output wire to the other hole where the resistor was. Tape a small piece of cardboard over the whole, so nothing will make contact with the motherboard's metal shell. Here is a picture, the cardboard isn't in place yet. 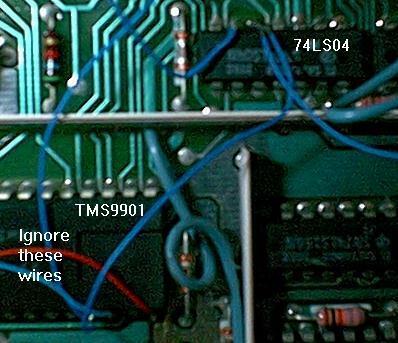 Locate the TMS9901: it's the 40 pin chip, with no heat sink. Attach a wire to its pin #38 (the third from the top on the right side) for P0, or to pin #37 if you prefer P1. The other end of the wire should go to pin #5 of the 74LS04 that is a little further up, on the left of the TMS9901. 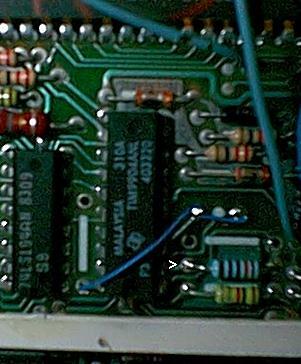 You will notice that pins #5 and #6 are currently not connected to any trace on the PCB. From the same pin, another wire should go to the OE pin of one of the oscillator. The OE pin of the other oscillator should be connected to pin #6 of the 74LS04. Which wire goes to which oscillator is up to you. If you used P0, the wire attached to pin #6 will select the default oscillator (i.e. the one that will be active upon power up). If you want a 3 MHz-by-default console, attach it to the 12 MHz oscillator. For a 4 MHz console, attach it to the 16 MHz oscillator. In either case, toggling the CRU bit will change speed. If you selected P1 instead of P0, be aware that the console power-up routine toggle this bit. So in this case, it's the wire attach to pin #5 of the 74LS04 that should go to your default oscillator. Here is a picture, in which I'm using P1 as the control pin. 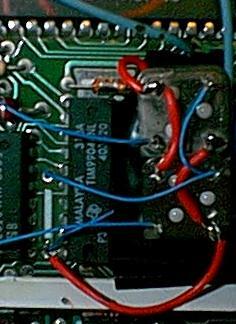 The reason being that P0 is used by another modification: please dissregard all these other wires. Here is a picture of the Phi3* signal captured by an ocilloscope during its transition from 4 MHz to 3 MHz. Observe how smooth the transition is (the black lines are markings on the scope's screen). Revision 1 1/13/02. Ok to release. Revision 2 11/16/02. Added picture.